Help the Kennedy Move Ahead. 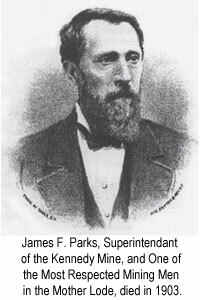 ♦ Amador Sawmill & Mining Assn. Investigate the Paranormal at the Kennedy Gold Mine! Spend the Evening at the Kennedy! Experienced paranormal investigators lead you through the property with access to all non-restricted areas. See for yourself if miners still work the mine! Space is limited so reserve your place now! $50 per person for Amador and Calaveras residents (ID required). ♦ Apr. 13, 2019 Saturday night starting 7 pm. ♦ May 11, 2019 Saturday night starting 7 pm. ♦ Jun. 08, 2019 Saturday night starting 7 pm. ♦ Jul. 13, 2019 Saturday night starting 7 pm. ♦ Aug. 10, 2019 Saturday night starting 7 pm. ♦ Sep. 21, 2019 PARACON EVENT: "Mining Under the Veil"
Save the Date and watch for more information on this exciting event! Please note that space is limited to 18 persons per investigation. A signed waiver must be filled out by each attendee in advance. Tickets are non-refundable but may be exchanged for another date. Participants are required to stay with their group. At the Kennedy Mine, nights are cool, and a warm jacket is recommended. Click our Book Now! button and pay using our Convenient and Secure Service. ...at One of the Most Famous Gold Mines in the Mother Lode! 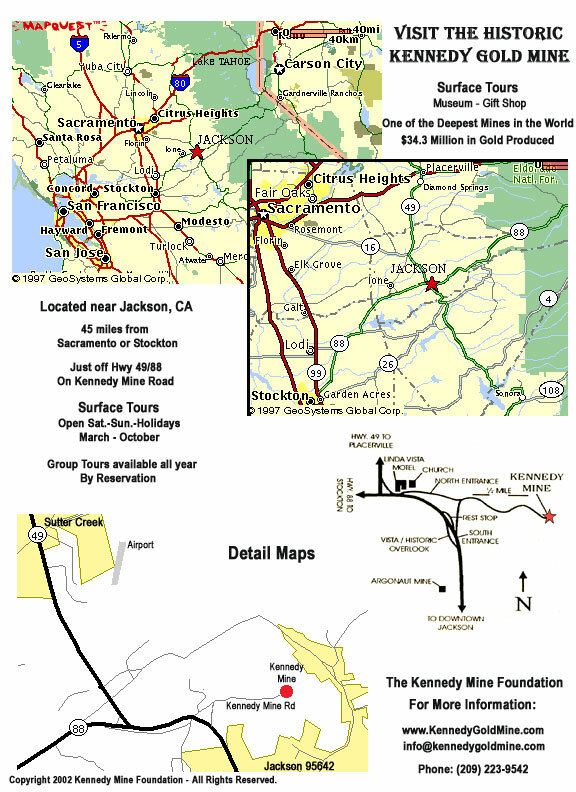 The Kennedy Mine, located near Jackson California (printable map), is open every Saturday, Sunday and Holiday from 10 AM to 3 PM, March through October. FREE Admission. Guided tours are: $12.00 for ages 13 to adult, $6.00 for youngsters 6 through 12, and free to those under 6. Group Guided tours are available, by reservation, all year. Guided Tours are recommended for an interesting, in-depth, and educational tour of the grounds [about 1.5 hours]. You may, if you wish, purchase a self-guided tour book in our gift shop and wander on your own. Some prefer to bring a picnic lunch and just soak in the ambiance of this historic spot. Also Teachers, Educators: We have a special Group Guided tour designed for your students. On the Kennedy Gold Mine surface tour, visitors see the mine office building where gold flakes were melted into large bricks to ship by Wells Fargo stage to San Francisco. This is also where ore samples were processed to see if a particular underground area was worthy of further investigation. See the stamp and gold recovery mill, tailing wheels, a steam boiler and the huge steel head frame whose pulleys guided the miners into the bowels of the earth. You will also see the building [now a museum] where the men changed into their mining garb before dropping nearly a mile underground to work. View a historic video of the men working circa 1914, and much more. Visit the Kennedy Gold Mine and gain new insight into the complications and hardships of the miner's way of life. The Kennedy Mine Foundation is a non-profit California Public Benefit Corporation operating under the 501(c)3 regulations. We hope you will come and enjoy the Kennedy Gold Mine with us and perhaps become involved in the volunteer effort. Donations are welcome and are tax deductible. For more information, please see "Sponsor or Partner with the Kennedy Mine". Come and visit the Kennedy Mine! Think Webcentric "We Have the Solutions"